Bill Self wants a 'dagger' point guard like Marcus Smart to help his Jayhawks close games come March. 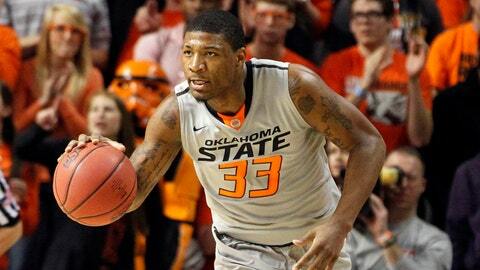 Bill Self wants Marcus Smart. Bill Self wants a point guard who can close a game like Marcus Smart, take over the court like Marcus Smart, get inside the heads of an opposing defense like Marcus Smart, dive into the crowd like Marcus Smart, who’ll be positively fearless and shamelessly cocky like Marcus Smart. Not the temper, of course. Or the international incidents or the rough edges or the back-flips or the showboating or the mouth that sometimes runs at 75 miles per hour while the kid’s cerebral cortex is doing 60. Self wants no part of that. Here’s what he does want, especially in March, especially now: Of Oklahoma State’s last 21 points late Saturday night in Stillwater, Smart scored 12, damn near all of them daggers. The sophomore from Texas netted 20 of his 21 points in the second half as the Cowboys rallied for a 72-65 win over Self’s No. 5 Kansas Jayhawks. When the KU coach praised his own point man, junior Naadir Tharpe — as he did after a Big 12 title-clinching victory at home over Oklahoma — he also underscored a very salient point: He wants his point man to close out games. To close out road games. To close out tough games. To close out big games. To close out NCAA tournament games. Kansas trots out two NBA lottery picks and another first-round draftee in the starting five, as well as arguably the best frontcourt in the country. But this is March. March doesn’t care about prep recruiting rankings. A hot guard (or two) can send the best frontcourt in the country home from Bracketville with a flick of the wrist. A hot guard can wipe away four months of hard work, all that muscle, in an instant. Michigan’s Trey Burke. Be that guy. That’s what the man wants. Self wants a "dagger" point guard. The guy who might miss his first five shots, or go wild on eight of his first 10. But that same guy is the one who’s going to get his. The one you want to take the ball when you’re down one, the shot clock running out, and let fly. With 1:23 left, down two, Tharpe tried to be that guy with a scoop shot. It was wild. On the other end, Smart took the rock with 47 seconds to go and laid it in to push the lead to four. Roughly two minutes earlier, the Oklahoma State guard — whose infamous shove of Texas Tech fan Jeff Orr last month got him suspended and sent the Cowboys’ season off the rails — had collected four straight points to cap a 21-9 run that put the hosts up 63-61. Oh, yeah, and did we mention the Jayhawks turned it over 22 times — six of them by Tharpe, six more by Andrew Wiggins? "Most of our turnovers," Self told KUSports.com after the game, "were self-inflicted." We’re not going to do anything. I told (the players) to put the shirts and hats under the damn bus. Travels. Happy feet. Wild outlet passes to God-knows-where. Guard play is to March what pitching is to October. It’ll carry you or bury you. 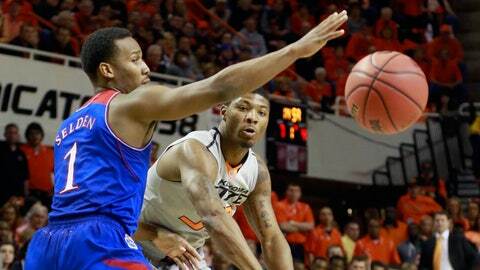 "We didn’t play our game," Jayhawks off-guard Wayne Selden told reporters. In the Jayhawks’ defense, Tharpe appeared to playing hurt over the final 10 minutes or so. And after KU center Joel Embiid seemed to tweak his already-gimpy back with 4 1/2 minutes to play, the Cowboys suddenly felt brave enough to go inside again, closing the contest on a 12-4 run. Because Texas and Iowa State both lost, the Jayhawks clinched the Big 12 title outright. Not that anybody felt much like celebrating, mind you. "We’re not going to do anything," Self told reporters afterward. "I told (the players) to put the shirts and hats under the damn bus." They’re lucky he didn’t make them walk home. Midway through the first half, KU had missed 12 of its first 15 attempts; Oklahoma State was 4 for 13. Every time the Cowboys went into the paint, the shot was changed, cajoled or outright rejected. At one point, the hosts missed 11 straight shots and went more than six minutes without a point. But the Jayhawks, by and large, were a hot mess in the first half, whiffing on 19 of 29 shots — 34.5 percent from the floor — and misfiring on 7 of 8 from beyond the arc while turning it over 11 times. And yet the visitors still led by one at the break, thanks to a plus-nine edge on the boards and an interior defense that forced a smallish Cowboys team to settle, out of safety concerns, for jumper after jumper. Smart was 0-for-his-first-7 from the field. At one point in the first half, he body-slammed KU forward Perry Ellis, then rolled off the Jayhawk big man’s back, arms up, to try and make it look as if Ellis had tossed him, judo-style. Bette Davis would’ve applauded. If Bette Davis were still alive, of course. "Well, you know, before the game, the coaches showed us a quote," Smart told ESPN. "Bill Self said he was coming here, cutting down our nets, and he was going to win it outright in Stillwater. And we couldn’t let that happen in our house." Hate him all you like, but Smart got the last word. The last laugh, too. In March, the cold-blooded ones usually do.